Cumberland Farms Salami Slicing Its Customers — 1¢ scheme? 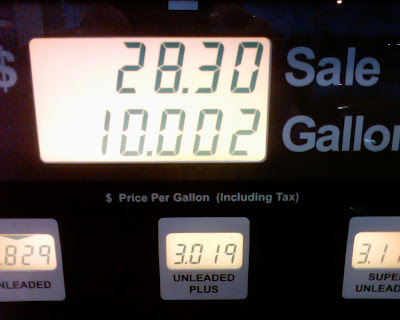 On the way home from work today I stopped at my local Cumberland Farms to buy gas. I swiped my debit card and lied to the machine and told it that the card was not a debit card. I pumped exactly 10.000 gallons. Now my hand is off the pump. A few seconds later I watch in disbelief as the pump adds an additiona .002 gallons to my total raising the amount I am charged by one cent! I suppose the valve on the pump could be malfunctioning, but I did not hear any more gas being pumped into the car! Now I really don't care about the 1 cent — but if they did to every one of their customers it would add up quick. I still buy gas there as it is the cheapest even after the 1¢ scheme. Just as a warning to others -- keep a sharp eye out when shopping at Cumberland Farms. District attorneys charged four men with fraud for allegedly installing computer chips in gasoline pumps that cheated consumers by overstating the amounts pumped.